A total of 26 heads of state or government from 21 countries, including German President Frank-Walter Steinmeier and Japanese Prime Minister Shinzo Abe, will visit South Korea for the PyeongChang Winter Olympics, Cheong Wa Dae said Monday. Japanese Prime Minister Abe is the only leader from the four regional powers -- the US, China, Japan and Russia -- visiting South Korea during the Winter Games. President Moon Jae-in will host a reception for foreign dignitaries ahead of the opening ceremony on Feb. 9 and hold bilateral talks over lunch and dinner with 14 others, including presidents from Germany and Slovenia, he added. 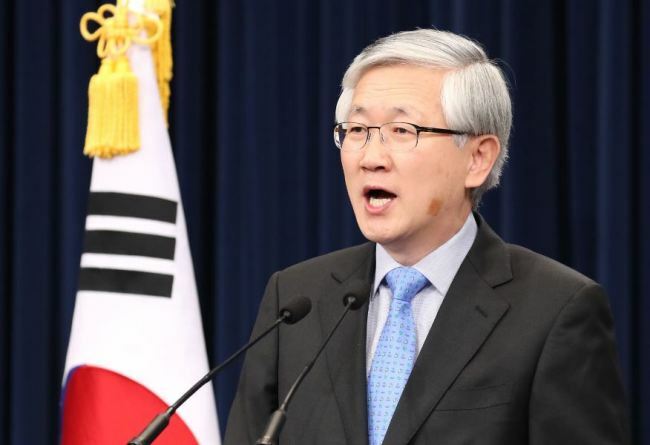 “Twenty-six state head-level foreign guests from 21 countries will visit South Korea and those from 16 countries will attend the opening ceremony of the Olympics,” Nam Gwan-pyo, the second deputy director at the Office of National Security, told a press briefing. With North Korea participating in the Winter Olympics, the Moon administration has been trying to invite as many foreign leaders as possible, particularly those from regional powers, to set the stage for diplomacy to defuse tensions on the Korean Peninsula. US Vice President Mike Pence leads the US delegation to the Olympics while Han Zheng, a member of the Politubo Standing Committee of the Communist Party of China will represent China as a special envoy of Chinese President Xi Jinping. Moon invited Russian President Vladimir Putin, but it is not clear whether he will join the event. Nam said he hopes Russia will be able to send high-level officials after resolving pending issues with the International Olympic Committee. The IOC banned Russia from the Olympics in December for state-sponsored doping, but cleared 169 Russian athletes Sunday to compete at the sporting event. Other attendees include the UN Secretary-General Antonio Guterres, Slovenian President Borut Pahor, Swiss President Alain Berset, Slovakian President Andrej Kiska, Polish President Andrzej Duda, Estonian President Kersti Kaljulaid and Latvian President Raimonds Vejonis. The list also includes Norway’s Prime Minister Erna Solberg, Netherlands’ Prime Minister Mark Rutte, Finland’s Prime Minister Juha Sipila, Liechtenstein‘s Prime Minister Adrian Hasler, Lithuanian President Dalia Grybauskaite, Sweden’s King Carl XVI Gustaf and Queen Silvia, Grand Duke of Luxembourg Henri, Denmark’s Crown Prince Frederik, and Monaco‘s Prince Albert II. The presidents of Germany and Slovenia, as well as the UN secretary-general, will make official visits, Nam said. The 2018 PyeongChang Winter Games, which is set to take place from Feb. 9- 25, will be the largest Winter Olympics in history, organizers said Monday. A total of 2,943 athletes from 92 countries had confirmed their participation in the Olympics by the 6 a.m. Monday deadline, PyeongChang‘s organizing committee said. Until this year, the 2014 Sochi Winter Olympics had been the largest with 2,858 athletes from 88 nations.